"Here's Why 9 Out Of 10 Email Marketers Eventually Explode!..." Relax Now There's A Way To Guarantee Your Messages Get Seen By 100 Percent of Your Subscribers Every Time! Let's face it, it doesn't matter how carefully you crafted that email or how long you spent putting that killer offer together if more than half the people on your list never even see your email - Email Marketers are losing out big time and it's getting worse. Spam filters. Ouch! But they're only 1 part of the problem aren't they? Don't Let Your Business Go The Way Of The Dodo! Look.. I'm sorry about this, but here's a question you'd probably rather not think about let alone answer... How much extra profit do you think you'd earn if every message you sent to your list was actually seen and read by everyone you sent it to every time? ...A guaranteed 100 percent open rate! 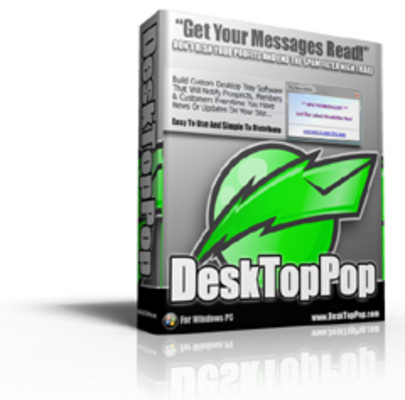 With "DeskTop Pop" You Can Guarantee They'll Get Your Messages - Every Time! This little 'silent salesman' quietly monitors the web page you tell it to (as often as you want) until you update that page. When you do - Bam! The application springs to life and lets them know! What does this mean to you? In simple terms it means you never need to worry about your prospects seeing your latest offers because you won't be worrying about your emails getting through. As soon as you update the page they'll know about it! * Backend Promoter - Strike up affiliate partnerships and promote them through 'DeskTop Pop'. * Membership Site's - Run your membership site through 'DeskTop Pop', now your members will always know as soon as you add new content. * Download Area - Have your website download area contained within 'DeskTop Pop' so you can bring people back to your offers long after they download your freebies! * And many, many more! The possibilities are endless. Let me show you exactly how 'DeskTop Pop' works. All you do is simply open the program, fill in a few simple options, and press "Build Application". 'DeskTop Pop' will create a file ready to distribute to your prospects and customers! Build Unlimited Numbers Of Applications - Once you own DeskTop Pop you can build unlimited numbers of applications in just seconds - Create them for every site you own and distribute as many of the mini applications as you choose. Let me ask you how much is 100 percent deliverability worth to you? Using this technology could easily add thousands to your bottom line each year - heck it could double your current profits this week... So maybe you're expecting a hefty price tag? As always your purchase is backed up with my 30 day, 100 Percent satisfaction guarantee so even at this ultra low price you can order now with confidence. Did Someone Say "SPY ON YOUR COMPETITORS " ?